I believe political parties are like football teams; we all have our favorite that we cheer for, but we can respect each other’s team. So when it comes to the District 2 Huntsville City Council Race, I want people to make an informed, non-partisan, decision. As a candidate, I felt that I could not come out and share these concerns. Now that I am not in the race, I can. As a lifelong resident of Huntsville, I care deeply about our community and want people to think closely about who they choose to represent them for the next four years. Akridge has her service on the Northeast Huntsville Civic Association as one of her big accomplishments, including serving as the organization’s president in 2017. In an interview for a local cable show, Akridge is vague about the actual membership numbers but states that she is looking to have ten percent of the neighborhood to join. But records from the Northeast Huntsville Civic Association paint a different picture. Under her leadership as president, Akridge only renewed 50 memberships and added 40 new ones. This means the organization had just over 1 percent of the population represented, based on the 7000 people that live in the Northeast Huntsville neighborhood. Many of my neighbors who once been involved with the group, left in frustration after Akridge took over, stating that she “hijacked” the Association. Fiscal responsibility is another theme that Frances claims as an accomplishment, but her leadership at the Northeast Huntsville Civic Association indicates she operated a deficit budget. Again, as president in 2017, the association had expenses totaling $1463, but only brought in $1025. Only a carryover amount of $820 from the previous year provided the organization the ability to stay afloat. The top two expenses included $397 in mailings and $380 for food at various events, with the lowest single expense as $70 for soccer balls at Optimist Park. Would you trust someone to manage a city operating budget of over $200 million who did not adequately handle an $1800 civic association budget? Frances Akridge has claims of her local accomplishments listed on her website that includes obtaining a drug bust and removal of a trailer on Rison Avenue, and a list of other items that were “obtained” or “secured” on Oakwood Ave, Peck Road, Chapman School, and Philpot Park. 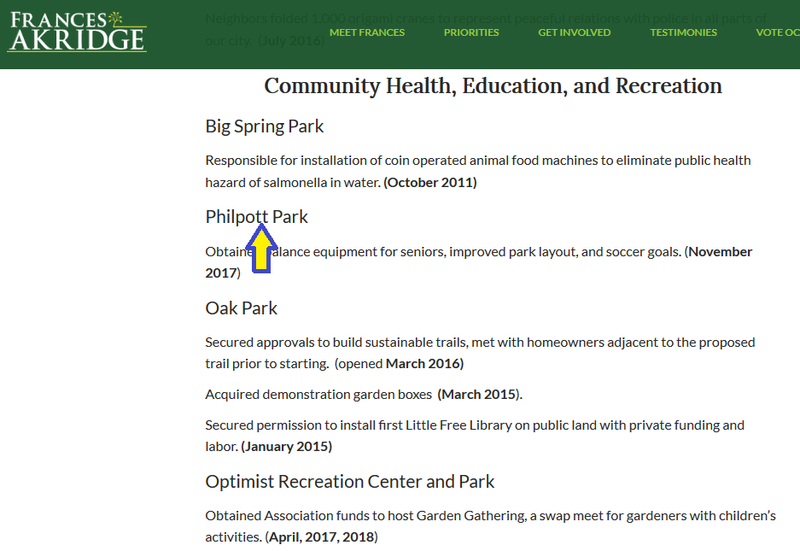 But those things that Akridge has listed as her accomplishments have been copied from the Northeast Huntsville Civic Association website, right down to misspelling of “Philpot” with two Ts. Akridge’s website also states that she “has worked with …city department managers, city administrators, & police”, in order to take personal credit for things listed as her “Track Record”. However, multiple sources with the City of Huntsville have said stated to me that Frances is NOT solely responsible for any of those accomplishments. But this is just one example of how Akridge has used the resources of the Northeast Huntsville Civic Association to benefit her campaign. The Association’s own bylaws, Article XIII: Political Party states: “The Association shall fully support the political process of public elections, but shall not endorse or support any single candidate in local, state, or national elections.” This year’s president, Scott Akridge, has allowed the group’s website and other social media platforms to be used for promoting his wife’s campaign events in direct violation of their bylaws. Frances has also violated Huntsville City Ordinance 72.6.8, which states, “No such sign shall be erected in or on any public right-of-way, public park, public building, public grounds, or other public place”…. It further states that “it shall be unlawful for any person to erect or maintain any such signs upon the property of another without first having secured authorization or permission of the owner or person in possession of the property.” Akridge violated this ordinance by placing signs and banners during her campaign event held at Oak Park, and brought signs, banners, literature, and buttons to a City of Huntsville Big Picture public feedback meeting held at Optimist Park. 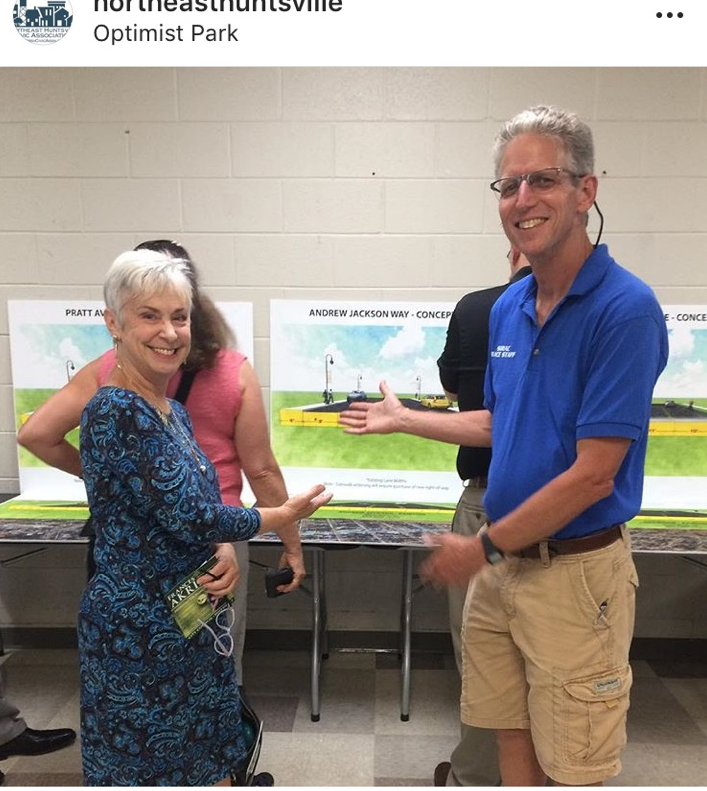 I personally witnessed her passing out material, including an attempt to have District Two City Council Member Mark Russell wear a Frances Akridge button. He refused. She also was broadcasting her campaigning efforts live to Facebook, claiming that the entire project was, “her baby.” A few days later, she deleted the video from her account. Multiple individuals have shared with me that Akridge placed her signs on their property without their permission or knowledge. Frances would often call or email the person the next day to say, “I hope you don’t mind, but I put one of my signs on your property.” In some cases, she did this to people who were supporting me with my signs on their property. And many of my supporters had those signs stolen, or vandalized. Akridge boasts that she received 49% of the vote, but a closer look at the August 28th municipal election indicated a voter turnout of only 12%. In breaking down those numbers, approximately 6% of the eligible voters cast a ballot for Akridge. If more people don’t take the time to vote in the runoff, Akridge will slide into a Huntsville City Council seat that represents over 36,000 people and all of those who did not vote will have no one to blame but themselves. Research each candidate’s records and cast your ballot for the one you believe is the best qualified. Don’t let your vote go to waste. There are more facts to share so look for more information soon.